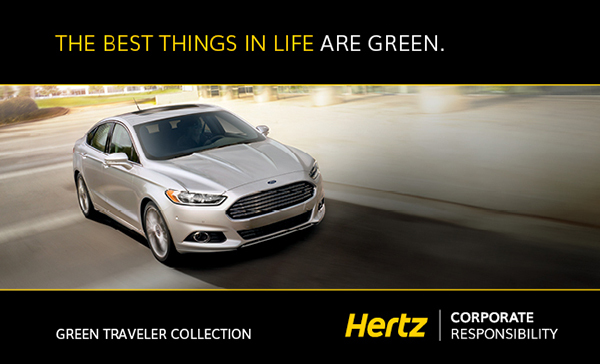 The Hertz Green Traveler Collection is our line of hybrid vehicles that offer high fuel efficiency and are easy on the wallet. Comparison based on 2011 models, EPA combined MPG, Mid-Size 26 MPG; Full-Size 23 MPG; SUV 17 MPG. Fuel pricing projections based on $3.78/gallon. Hybrid savings based on Camry, Altima, and Prius hybrid models. The car that started it all - and became a global sensation while it was reducing emissions. No wonder so many environmentally-conscious people, including major celebrities, drive one. Seating for up to 5 and a high-tech interior. The technology of the Prius applied to a larger, roomier vehicle – America’s favorite sedan just got better. Room for 5, with better acceleration and fuel economy than the standard Camry. Like the Prius and Camry, the mid-size Altima is a true hybrid, but wrapped in a sporty look. The Altima Hybrid has all the power you need without sacrificing those 33 MPGs or 5-person comfort. Drive the future – Plug in to the EV revolution with this sophisticated zero-driving-emissions vehicle. With easy charging and a range of up to 100 miles, the Leaf is making emissions-free transportation a reality. Available at select locations. Efficiency without compromise – Clean diesel technology allows you to enjoy 42 highway MPG and a 600-mile cruising range, all with the driving pleasure of a responsive turbo engine. Available at select locations. Drive Clean – Join Hertz in its pilot program of clean-burning compressed natural gas vehicles. These vehicles emit up to 30 percent less carbon dioxide and up to 75 percent less carbon monoxide than comparable gasoline vehicles. CNG fuel also typically costs half the price of gasoline and is produced domestically in the US. Hertz is offering Honda Civic Natural Gas and specially-converted GMC Yukon models for rent at Will Rogers airport in Oklahoma City. Give one a try today.